There are many common items of furniture in everyone’s home. One very common item that many do not necessarily think about is a desk. However, the majority of homes have one. A desk can be used for a variety of things. It can be used for anything from a workspace, a space to figure out and pay bills, or, for some people, a space to collect old mail and newspapers. Even though there are many reasons a desk may be used, most homes do have one. In the world of desks, there are a lot of options. Variety arrives at your workstation in droves, granting us the opportunity to select the most fitting surface for your given lifestyle. This article has been reviewed and revised to ensure the reader is obtaining the most current children's desks. 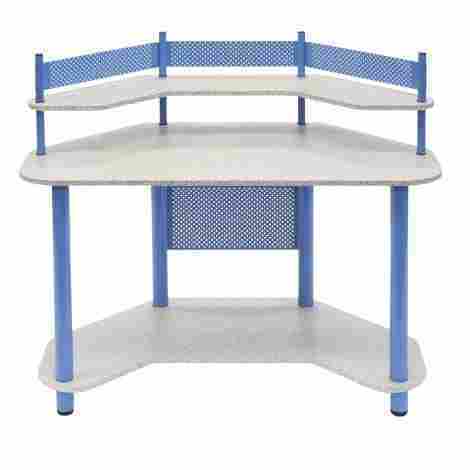 The top three children's desks have remained the same. The most frequently asked questions have been updated, and outside sources have been included throughout the article. When your child is young, there’s nothing better that you can possibly do in your attempt to free them from the shackles of dependency, than to give them things of their own. A place to eat, a spot to work on their school work, or just an awesome desk to figure their stuff out art-wise, to make a mess of their own. The desk is a hub. The desk is a spaceship, a vehicle to get you to a million different planets of creation and production. A desk is a great tool for children. Many children enjoy doing arts and crafts, and have a plethora of assignments and homework when they come home from school. A desk is the perfect items for a child to have their own space to be able to work on some of these projects. Not only does it allow them a certain space to work, but it also gives them the space and time to focus into something they need to accomplish. This type of idea creates the discipline for children to play during play hours, and focus when needed. Whether it be for fun, education, or everything in between, there’s a dizzying variety in kids desks. Let’s get through the best of the best. The aspirations of an art desk are vast. There are a lot of things they try to bite off in order to be the one desk you might need to use, for any reason what-so-ever. For the most part, it’s extremely good at such a thing. So when the time comes to acquire your child a desk that will serve many a purpose, an art-style desk is probably your best bet. Heralded for their quality, and the make of their products, the VIVO Children’s Desk is one of, if not the best, option on the market for a kids work and play station. The scariest thing when talking about, or seeking to purchase something for your small child is the burning of money. We’re talking about everything under the sun. Everything of a fixed size. Clothes, sports equipment, and yes, even desks. Kids grow up, and grow out, and their size is never the same from one hour to the next. We don’t stop growing for quite some time. The VIVO Children’s Desk is a complete work of art in its simple ability to grow with your child -- only up to a certain extent obviously. The dek and the chair both have the adjustability to raise or lower with the height and size of your child. VIVO doesn’t cut any corners when putting together the build for their children’s art-style desk. When many companies or manufacturers are willing to excuse laziness because of the target audience, it’s nice when someone doesn’t. The VIVO Children’s Desk has a full art supplies drawer, with separators and organizers galore to house your utensils and papers. The tilting surface of the art desk makes it easy to get up close and personal with your work, and it folds down flat to keep it useful for other arts, eating, and many other things. You’re going to have to pledge up a bit of dough in order to give your child a spectacular desk for all of things they might want to do with it. 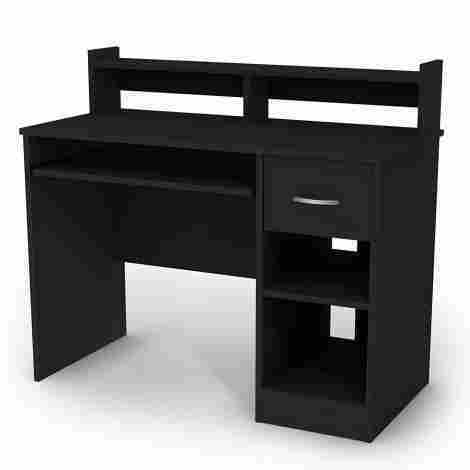 This particular option is an astounding all-around brilliantly usable desk that won’t be outgrown quickly. It is made out of extraordinarily well thought out products and high-quality materials. Heading in the completely opposite direction, the Sauder Pogo Desk for Children attempts to simulate the normalcy that your child will be striving for, everyday of their life, from this moment onwards. There’s something about the tiny version of a normal looking adult thing that is both adorable, and desirable. There’s a whole wing of children’s toys that attempt to replicate grown up versions. Like drivable cars, kitchens, and this desk. Visibly, it’s something out of an IKEA catalog, but it has some very useful tricks up its sleeve. Aside from it’s stunning ability to appear like an adult piece of furniture, the Sauder Pogo Desk for Children has one of the biggest toy chests, or cupboard for all of the loose goodies you could possibly have around. It’s the twenty-first century after all. There’s no need here, and now, to keep a large truck in your child’s space for the sole purpose of keeping all of their playthings in order. This giant storage bin, along the side of the desk is a key for the decluttering. There are far too many things in the world that you can overthink as a parent, and a million books that can give you advice on which direction to take, and how to take said direction. Here, we’ll help you with a very small, and easy to do step. Treating a child like an adult, conjures a growth of responsibility and self-respect that almost nothing else in their life might. Getting something that resembles an adult piece of furniture is a great way to subsequently communicate to your child that you respect them as such. It’s a prime piece of furniture. And one that will last quite a while. Unless your child grows up to be on the large side of human beings, you may never have to replace this desk (though it will become far less comfortable to work on as they grow larger. 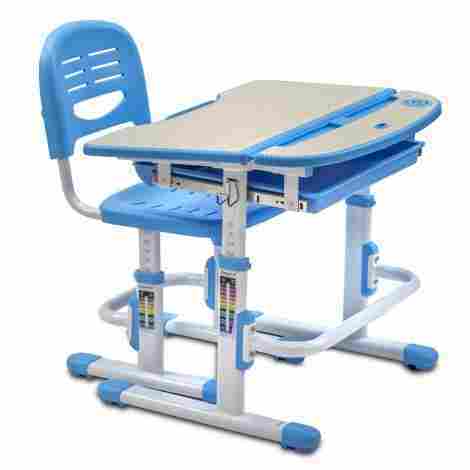 When you stop and think about what a “kids” desk looks like, you probably pictured this product. Don’t get us wrong, there is a ton of value in a product like this -- hence why it is currently on our list, and I’m currently writing this entry. But we felt that picking a majority of desks suitable for kids throughout their young lives meant more. 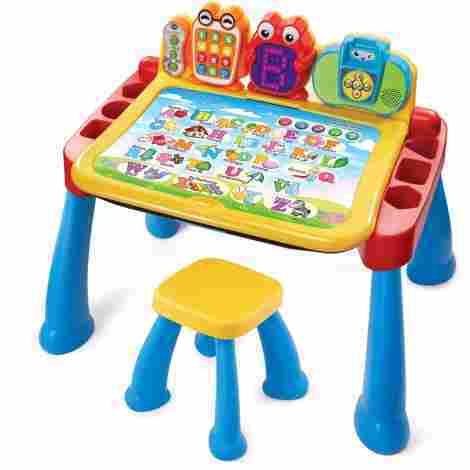 The VTech Touch and Learn is a wonderful product that can do wonders in the development of a tiny mind. With removable and replaceable table-top board that range from alphabets, shapes, foods, and colors, the Touch and Learn system is a fantastic way to introduce communication, comprehension, and understanding to a child. The bright, and fun characters and colors on the boards draw the eye in, and there’s even a speaker and activity teacher built right in that will prompt your young one to play and learn along with it. It’s an invaluable tool, and also a desk! Game cartridges feature over 100+ vocabulary words, 20+ activities, and 20+ songs. There’s a large chance that a desk is going to take a bit of a beating from a toddler (this product is technically rated for children two years and up), so the sturdiness of the VTech Touch and Learn Activity Desk Deluxe should easy your mind quite a bit. In addition to that, there is tons of onboard storage for utensils, beverages, and shape blocks. At around fifty dollars, you can’t argue that a fun, interactive, and educational desk isn’t a good value for your child. Especially considering the versatility (it can be converted to an art isle, or chalkboard). There’s a dizzying amount of value in this desk, and if we weren’t so keen on offering children something that will mean more for longer, the VTech Touch and Learn Desk would be much higher on our list. It may not be something extremely prevalent in a young persons world, the act of working on things with electronics as tools, but there will come a point down the line where it happens. The South Shore Axess Desk has a wonderfully built-in set of cut-outs on the backside of the desktop and selves that help ease the clutter of cables if and when your child needs that kind of set-up. It was essential that we put a handful of real desks on this list, things that would be great to get your child, something that they will use for years to come. There’s no need to buy a piece of furniture that will be outgrown quickly, and there is very few actual uses for those miniscule plastic children’s desks. This is a big kid desk, because your kid will get there. It’s much more resourceful to get them a desk that can withstand, and a higher chair, than a tiny desk the stretches not an inch. It’s not expensive, and it will fit your child’s need for years to come. Made with high-quality materials, with an ease of assembly not often seen outside of Swedish furniture stores, the South Shore Axess is an astounding value, a small fit, and a wonderful workspace for all of those important years in a young person's life. It’s often a problem you don’t think you have to solve, until you do, and at that moment you wish that you could go back and tell your formal self to be more considerate of the space at hand before purchasing a piece of furniture. Well, the Target Marketing has their market targeted. Offering the perfect amount of desk for the corner of rooms, minimizing the space that must succumb to your workstation needs. Plenty of well planned opportunities for activities are foiled by the surroundings of said said plan. An environment plays heavily into the ability those have to take their freedom of fun to the next level. Tucked into the corner, the Target Marketing Systems Wood Corner Desk is an essential amount of desk, with the ability to be as out of your way as it possibly can. It’s wonderfully simple footprint grants the user a ton of space to do work without living in the middle of your room. No, time does not stand still at this desk. The constructs of time and how it rolls blissfully forward regardless of how great or horrid this moment may be, are unchanged. The Wood Corner Desk from Target Marketing Systems does however resemble an ancient design, with a classic feel and retro styling. It’s antique looking, almost. Fancy, even, depending on your tastes. Everything on this list so far has been in the one hundred dollar price range, and the Target Marketing Corner Desk is no different. We’ve offered a ton of different flavors on the same budget thus far, all with amazing construction, extended use cases, and appeal for many different age groups. The value of the space you’ll save, the beauty of this piece of furniture, is apparent right away. Usually, it’s not a great sign when companies throw a bunch of random sounding numbers in a product name, but the Calico Designs 55120 is an exception. No, there isn’t an apparent reason for the number, but perhaps there is internally. The Calico desk is the epitome of sleek style, and minimalism for the sake of ultimate customization. But it’s also extremely functional, and rather neat looking. It’s an uncommon occurrence for a very useful piece of furniture to also come in interesting, off-beat colors that can help bring some life to your pastel room. For younger folks, that might be essential in your choice of desk. The soft blue, coral pink, and lavender purple truly stand out, while there are black and beige options for those that would rather put the color on their workspace themselves. There’s no harder task in designing furniture than coming to a finality that is both extremely useful and full of so much potential. We (the human race) often work better or harder when their environment reflects the comfort of our own personality. With plain surfaces, and pin-hole grates all over the place, the Calico Designs 55120 Corner Desk is begging to have photos and stickers pinned all over it. There’s a million avenue to take, and all of them wind up somewhere really awesome. The Calico System is going to fetch a high price. But if you consider the ability to turn this desk into a reflection of self -- something young people strive for -- it makes up for the cost in its versatility. The make and build of the piece is also very strong cause to spend a little bit extra to bring a desk into the life of your child that will serve them well for years to come. Calling all greeting card parents, and their crafty children! We’ve found the mecca of wondrously awesome desks for your children that are handmakers and craft posters. We’ve all met them. Those toddlers or kids that are just inclined to make things. Macaroni wreaths, pictures for the fridge, or their own valentine’s cards (yeah kid! Stick it to the corporate valentine day card zombies). 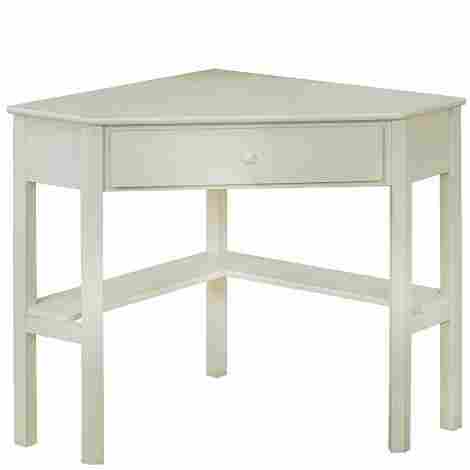 The Guidecraft Media Desk is designed to do exactly what its name suggest, guide you easily through your crafting needs. Photos of friends, family pictures, or just cut-out magazine clippings of youthful crushes, the corkboard has for a long time been a beautiful way to add a bit of flare and personalization to a given piece. The back of this desk surface is completely corkboard and awaits the unique touch of its owner's personality in order to transform this desk space into a wonderful place for self-expression through the art of craft! … or your homework. You have to do that too. Like its more expensive counterparts, or the more adult-focused versions, the Guidecraft Media Desk and Chair Set are designed with the sole purpose of having all of your craft needs at hand. Whether it’s the surface area needed to have a bunch of pen holders, or (as is the case here) a handful of horizontal paper-sized shelves to separate your crafting materials from one another. Either that or your child can use them to keep inbound and outbound invoices organized. But we’re going to assume they don’t have any of those. There’s a hefty price tag on the elegance and resources this desk and craft area can supply your child. At double the price of most of the desks on this list so far, it may be of great value to you if you’ve got yourself a crafty critter in your litter. But may not be your best option if your child is less artistically inclined. The build and use of this desk however, greatly justifies the price as it stands out above most others in both of those categories. Billed as a “school workstation” it’s awfully similar to the number one item on our list, but differs in enough of the categories to find its way all the way near-ish the bottom of our list here. The Mount-It! (why are you yelling?!) 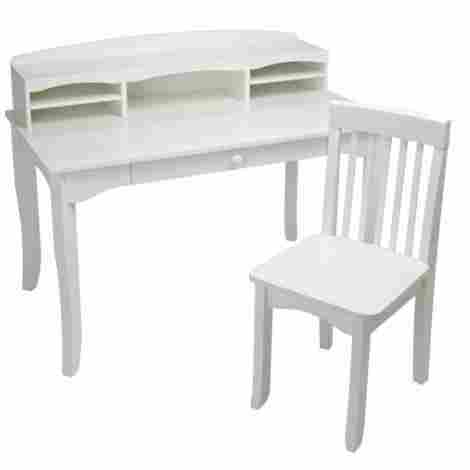 Children’s Desk and Chair Set is, in form, the essential desk for children to grow up on. 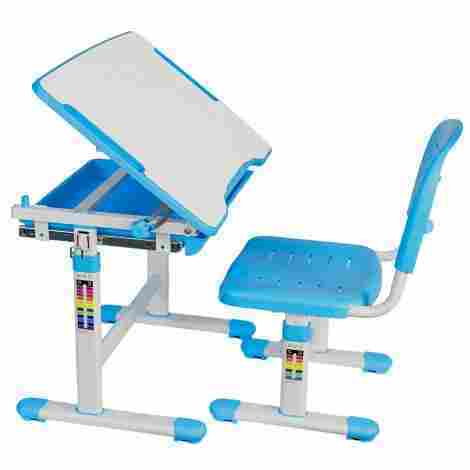 It’s formed and designed like a school desk, but is made to scale with your child for a limited time. Humans are tricky creatures, and instilling your child with a sense of discover, learning, and yearning to be better from a young age is a great thing to do. Attaching those systems, ideologies, and habits in respect to the sight of a working school desk could play a huge role in ensuring that they are comfortable when soaking up knowledge sitting at such a desk. Some might think bringing “school life” into your home defeats a purpose that doesn’t actually exist. Comfort breeds ease, and there’s an ownership here. At nearly twice the price as the product of a very similar build, you’d be better off noticing that the build quality is slightly higher than previous items of similar use on this list. There’s room for improvement in the cost department for sure, but the storage and use of this product is off the charts. Have you ever wanted to buy an art desk for your child that they might be able to convert into a vanity later in life when they choose to start wearing makeup? No? Yeah. Thought that was a bit of a stretch. 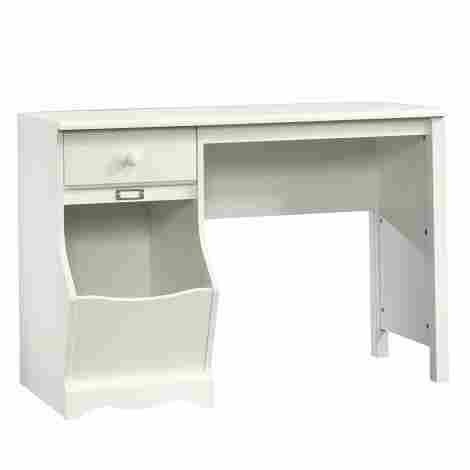 But the KidKraft Large Avalon Desk definitely has some of the appeal of a classically designed vanity (sans mirror obviously). This craft-centric workstation is a perfect addition to the room of any artistic young mind. Looks aren’t always everything -- I’ll repeat it, for the children reading this … LOOKS AREN’T ALWAYS EVERYTHING -- and that is especially prominent in the case of purchasing furniture. Generally, furniture pieces have uses, and those pieces need to perform their intended use to the specs that you need them too. Desks need storage, space to work, and quality materials, all without taking up too much space, or costing an arm and a leg. So when you look at the KidKraft Avalon Desk and you are spun through time to a world of old fancy hollywood with clutched pearls and dazzling lights, know that the aesthetic of this desk is unbeatable. Quick! To The Craft Mobile! Holy craft batman! (not to force another mention of pop culture or film and television into a single product review) but this desk has an abundance of space both on its desktop shelves, and undertop drawer, to hold any and everything you might need to get crafty. A premium desk, at a premium price, will no doubt sway some potential purchasers away from the KidKraft Large Avalon Desk. But if you’re looking for a brilliantly beautiful piece of furniture that will do all of your child’s art projects justice in actual use, then look no further than this piece of hollywood glam. Should you, be the parent of a burgeoning tiny Hemingway or Kerouac, or perhaps you were plucked from your fictional prose future, and thrust into the heap of drafts that is parenthood, the Lipper International 564P Desk and Chair set is a flawless excuse to return to a time where poetry was alive. If you’re looking to raise a writer, and get a head start on that internet conflict and external complex, then look no further. There’s something about the classic furniture of old. The wooden, handmade desks where authors and poets of all shapes and sizes cursed by the gift of wordplay would strive to break new ground. The look and feel of the Lipper International leaps from the writing room in Hemingway’s cuban villa, and would make the best of the beats blush with anticipation. It’s sleek, and classic. Under the main top of the classically handsome wooden desk is a large open bin that would be very tricky to fill up to the brim with eccentric clippings, and paperbacks of inspiration. Toys? Sure! They’ll fit under the canopy of this flop top. But does the next Maya Angelou need toys? Probably not. It will fit all of your scraps, your red string (for conspiracy work), and roughly a million pencils. How dare you try and put a price on the future of a dying vocation! I jest. There’s a time and a place where those of the world fall in love with a generation that they may not even live in, nor have they ever experienced. Generally, this is a desire that is prayed upon by designers and manufacturers. The price for retro or vintage is steep, but not here. Under a hundred dollars for this beautiful classic, that comes equipped to hold all of your desk needs, the value is high with the Lipper International. 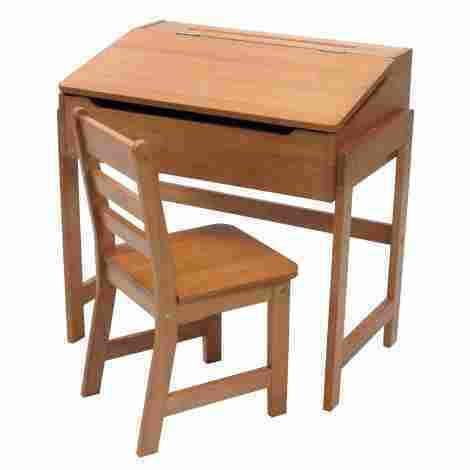 The market of workstations, or art desks for our younger generations is wide. Not wide enough to fit everyone’s needs into it. But it’s close. No matter the child you’re buying for, there is probably an option on this list that would work wonders to change their fun and homework situation. The quality of building materials in nearly everything should come into consideration when you spend your hard earned cash. It is even more essential when looking at purchasing a piece of furniture. As most furniture is used by you, or by someone, there will come plenty of opportunity for wear, or worry when it comes to the make of your piece. When it comes to furniture that your child is going to use, that is amplified by both the idea that your child might be less careful, and your child might be harmed if something were to break. In each of our choices, we carefully examined the listed building materials and scoured the reviews for signs of poor manufacturing. A task you should also do when shopping online for things like a desk or workspace for children. Finding something with quality metals, and real wood isn’t impossible but is also not the norm in furniture manufacturing these days. Pay close attention to the build, and you shouldn’t have a problem when it comes to the use of your chosen piece. Or, at the very least, you won’t be shocked if something does go wrong. Some might look at a room full of desks and consider that there aren’t many variables among them. But they’d be extremely mistaken. Most desks are considered for their modular properties, and every desk set-up is different in one way or another, therefore it was crucial to us that we seek quality desks but with a variety of designs and ideal use cases. You’ve got art desks for those with the need to craft creations. You’ve got writing desks for the future Rowlings of the world. And you’ve got an option for everything in between. It’s key to also note that desks, desktops, or workstations can be used for all sorts of things. So while some of the features included with the desk might be geared towards a specific type of desk work, having enough space and versatility to be used for many things is important. The look of a desk isn’t the most important part. But as it’s a piece of furniture, and there are other pieces of furniture around it, the aesthetic of the piece you buy will probably need to fit into the decor you’ve already got set up in your space. Our particularly beat-generation style writing desk has that uniquely mid-century wooden look, while others like our number nine pick would fit in on a Hollywood staged set from the Monroe era. Others, like a handful near the top of the list are more modern pieces that resemble most of the furniture that is made and manufactured today. Other bits of flare are more of a concept, or opportunity to add your own. Some of our options are great blank canvases that would look absolutely amazing with some personalization from your youngster. Of course, the biggest criteria for finding the perfect piece of furniture is the proper combination of price and build. The price has to reflect a quality product, but also not force you to break the bank for something that might be outgrown eventually. For the most part, our entire collection here floats around the one hundred dollars mark, though a few go a bit higher, and a few fall a tad shy of that mark. When it comes to things made out of wood, or metals, or high-quality composites of wood board, there is more than a direct correlation between the price that you face as a consumer, and the cost that the manufacturers are required to play in order to get them out the door. Markup retail prices aren’t a huge thing when it comes to furniture, so you can rest assured that the correlation is far closer to the worth of the product than other types of goods. On this list we provide a bunch of amazing desks with a varying amount of price tags. Q: Will it fit my child? A: Yes. In a general sense. Even though most of these desks are maybe geared towards older children, or life-long use, there are some easy to add hacks that will allow your younger child to sit at the desk. It is advantages for those looking to get a desk for their child to get something that they won’t outgrow. Booster seat on the chair, or a different chair altogether. It’s one of the only things you can plan for your child to “grow in to”. A: Most pieces of furniture, especially if they’re being sold by a reputable company, will have all of the dimensions in the product listing. These are important, as furniture can be something folks get really particular about. You want it to fit in your space. Providing that information ensures that with a little bit of measuring, consumers can get the piece that they want. Normally, the height of the desk measurement will be from the ground to the top of the desktop, not the space in which you put your legs. Keep that in mind when reflecting on the listed measurements. A: To be honest, you should spend a fair bit. As with almost everything, you should work within your budget. 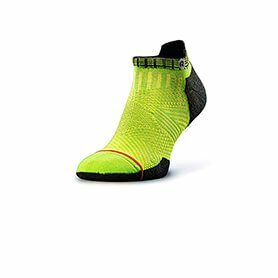 There are options to fit the needs of all budgets. But as furniture is something that will benefit from a higher quality of the manufacturer. While we don’t necessarily take this particular stance: spend as much as you possibly can. The more corners you cut in the cost department, the less happy you will be with your end product. A: Most of the products offered in the twenty-first century are fairly easy to put together once you get all of the pieces out of the box. Much like lego, you will most likely find a very easy to read and parse visual assembly guide that may or may not have numbered marked pieces. Nothing should be overly complicated. Q: Why would I want to buy an ergonomic desk? A: Ergonomic desks assist individuals in sitting or standing in a way that is beneficial to their height and body type. This helps to alleviate strain in areas of the body where it should not be. In turn, a desk like this will help lower stress level, improve a child’s productivity and focus, and lower the risk of musculoskeletal disorders.